Hello producers! Thank you for checking out our latest product: Best Tropical Presets and Samples. Please use headphones to listen to the demo and hear the quality of this bundle! Best Tropical Presets and Samples is an impressive sample and preset library that provides extreme quality made by producers for producers! This bundle will give you the inspiration and spark of creativity you need for your next track! Best Tropical Presets and Samples was created with care and effort for quality while being influenced by top Tropical producers such as Kygo, Thomas Jack and many more! Best Tropical Presets and Samples brings you a collection of 100 Samples .Wav format and 42 carefully crafted presets each with macro control that will get your creativity flowing. Here is a deep look into this great bundle and some extra info that may help you. • 63 One-shots including Kicks, Snares, Hats, Crashes, Claps, Snaps and a LOT! of amazing percussion like Shakers, Tambourine, Conga, Bongo! • 21 Music Loops and Drum Loops covering Kicks, Shakers, Hats and other percussion! • 15 FX including Ambient Sound Effects, Risers, Downlifters, and more! 42 astounding presets that were carefully crafted to bring the most out of your production and to help boost your creativity without spending hours on sound design. • Requirements: NI Massive v1.3 or higher. 8 awesome bonus Midi Files are included in this bundle just for you. 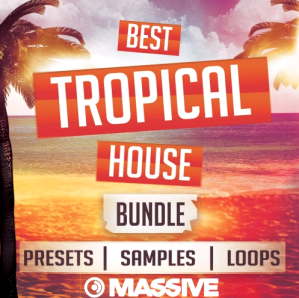 Everything in this bundle was created to have that “Tropical House Feel” to it to make it simple, you don’t have to worry about sample processing or sound design - just get creative with your track!